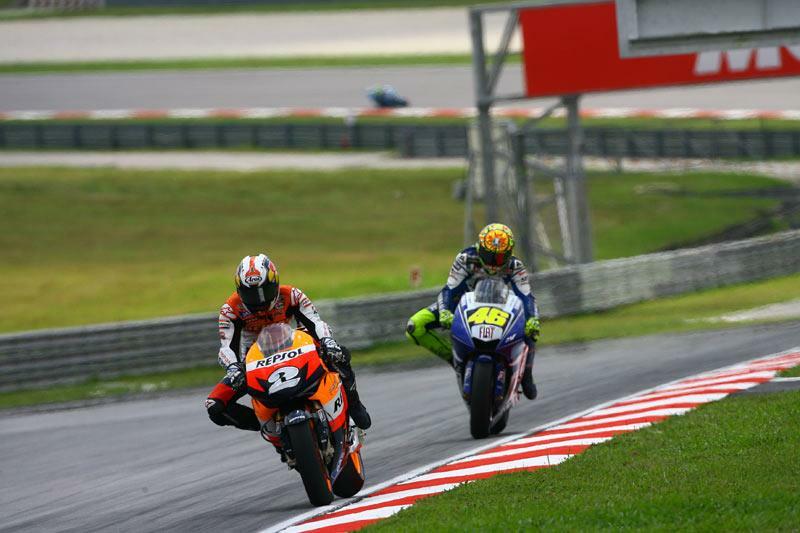 Spaniard Dani Pedrosa secured third place in the 2008 MotoGP world championship with a hard fought ride to second in a sweltering Sepang clash. Pedrosa’s distant second to Yamaha rival Valentino Rossi and compatriot Jorge Lorenzo’s non-finish means Pedrosa clinched third overall in the standings. But once Rossi passed the triple world champion on lap 11, Pedrosa was left to ride in a comfortable second place to claim his best premier class result in Malaysia. He said: “It has been a busy weekend. On Friday morning we were only 17th, I think, then we started moving forward and yesterday we were able to get pole and today I finished second, so finally it has been a good weekend for me and my team. "We have made another important step forward after Phillip Island where I crashed out of the race and hurt my left knee. At the end of today’s race Valentino was faster than me, he always puts on some extra pressure towards the end, so it was difficult to follow him, but we were closer this time than we were at Motegi, so I am happy that we are making progress with our new bike and tyres.